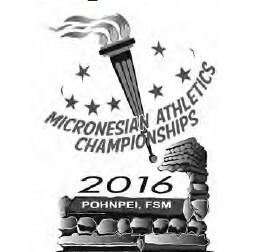 Pohnpei will be hosting the 2016 Micronesia region Athletics (Track and Field) Championships from June 2-4, 2016. The best Track and Field athletes from the region, including Guam, Palau, Marshalls, CNMI, Nauru and the FSM will be competing in running, jumping and throwing events. The FSM largest group of athletes will be from the host Pohnpei, with over 30 youth athletes. Yap and Chuuk will also be participating. This is the first time this competition has ever been held in the Micronesian region. The championships start with a Technical Meeting for all coaches and technical officials at 3pm Wednesday, June 1 at the FSM National Olympic Committee conference room. A welcoming dinner for all athletes, coaches and officials will be held at Cupids Grill at 6pm on Wednesday, July 1, hosted by the Office of the President, FSM National Government. The track meet official starts on Thursday, June 02, at 3pm, at the Pohnpei Track and Field, with the main event being the 100 meter men and women preliminaries and finals. The second day, Friday, June 03, will start at 2pm, with preliminaries and finals in 400 meter, Long Jump, Shot Put and other events. The final day, Saturday, June 04 will begin at 1pm, with preliminaries and finals in 200 meters, 110 hurdles, relays and other events. The championships will be coordinated by the Oceania Athletics Association (OAA), based out of the Gold Coast, Australia. OAA is the Oceania continental organization in charge of Track and Field in the region. FSM Athletics Association is a member of OAA. OAA supported the Micronesian Athletics Championships by providing some of the airfares, hotel accommodation and stipends to visiting athletes and coaches, and professional technical officials and equipment (photo-finish). Geoff Gardner, OAA President and Yvonne Mullins, OAA Executive Director, will arrive on Pohnpei on Friday, May 27 to supervise the championships. OAA will also be coordinating the Polynesian and Melanesian Athletics Championships later this year in Fiji and Tahiti. Pohnpei also formed a local organizing committee chaired by Pohnpei State Lt. Governor Reed Oliver, with Jim Tobin as the Secretary. The committee has recruited over 100 local volunteers as track officials, drivers, security, protocol, medical, and clean-up. OAA will provide a one day track and field officials training on Monday, May 30 for all the local volunteer track officials. Mike Loyola, and his Pohnpei State sport office staff, and Rendy Germinaro, and the Pohnpei Track and Field Club, have done an outstanding job preparing the Pohnpei Track and Field venue for the championships. The local organization committee would like to thank the great support of local sponsors for the championships: Office of the FSM President, FSM National Government; Pohnpei State Government; Pohnpei Delegation, FSM Congress; FSM National Olympic Committee (FSMNOC); Palm Terrace Shopping Centre; Matson Navigation; 7 Star Inn; Ace Hardware; FSM Petro Corp (Vital); FSM Telecommunications; Bank of the FSM; FSM Development Bank; Napa Auto Parts; Ace Office Supply; Etscheit Enterprises; Caroline Fisheries; Pohnpei Cinema; Deloitte and Touche; Pohnpei Water Company; CTSI; Pohnpei Hardware; Bank of Guam; Drops of Life; CTSI; Adams Construction, Genesis; Isamu Nakasone Store (INS); LP Gas; Namiki; NIHCO; Moylan’s Insurance and National Fisheries Corporation (NFC). During the recently held 2014 Micronesian Games track and field competition, 1000s of Pohnpeians turned out to support and cheer on the athletes. We are hoping the same will be true for the 2016 Micronesian Athletics Championships. Good luck to all of the athletes.